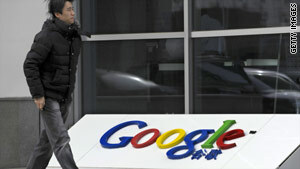 A man walks past Google's China headquarters building in Beijing on Wednesday. (CNN) -- Secretary of State Hillary Clinton's Thursday speech on Internet freedom will address the Google censorship fight in China but won't stop there, a top adviser said Wednesday. Alec Ross, Clinton's senior adviser for innovation, said the address will roll out a new set of policies meant to encourage online freedom worldwide. "We don't just view the issue of Internet freedom as an issue of freedom of expression," said Ross, speaking at a panel hosted by the nonprofit New America Foundation and Slate magazine in Washington. "But it also goes to the issue of what kind of world we want to live in. "Do we want to live in a world where there is one Internet ... or do we want to live in a world where the information you have access to, the knowledge you have access to, is based on what country you live in?" The conversation comes as search-engine giant Google is threatening to shut down its operations in China, five years after agreeing to allow some censorship in exchange for the right to work in that country's massive emerging technology market. Google said on January 12 that the company and at least 20 others were victims of a "highly sophisticated and targeted attack" originating in China in mid-December, evidently to gain access to the e-mail accounts of Chinese human rights activists. In a statement that day, Clinton said that Google's allegations of censorship and online attacks by China raised "very serious concerns." Days later, foreign correspondents in at least two China bureaus of news organizations had their Google e-mail accounts attacked, with e-mails forwarded to a mysterious address, according to the Foreign Correspondents' Club of China. Google now says it's no longer willing to be censored in China and will consider other options, including leaving the country, if it is not allowed to work without government filters. Officials at Google briefed State Department staff about last week's attacks, and the department has officially lodged its concerns with China. "We've asked for an explanation," Ross said. "We've had conversations over the years where we have made clear our concerns about the issue." But he said the Obama administration also knows that the situation is primarily a dispute between a U.S.-based corporation and a foreign government. "We're taking this very seriously but, all that said, the State Department is not the foreign policy arm of Google," Ross said. He said Clinton's proposals will address China, but noted that it's far from the only place where the government is known to interfere with online access. Ross said that 31 percent of the world's population is in countries where there is some Internet censorship. "It's something that's been of a great deal of concern because it really exists at the convergence of economic issues, human rights issues and security issues," Ross said. Evgeny Morozov, a Georgetown University fellow and contributing editor at Foreign Policy magazine, said that cyberattacks have been recorded more frequently in places like Russia and Eastern Europe than in China, and that such attacks are increasingly being used against activists everywhere. "Many [nongovernment organizations] and many activists around the globe are now subject to these attacks, which make their sites inaccessible for a few days a month or a few days a week," said Morozov, also a panelist Wednesday. "They're seeing it as a new form of censorship." Clinton's speech is scheduled for 9:30 a.m. ET at the Newseum in Washington, D.C., and will be streamed live at http://www.state.gov. In it, Clinton "will lay out the Administration's strategy for protecting freedom in the networked age of the 21st Century," according to a State Department news release.